This section summarises the key themes that emerged during the interviews with key members of staff at ICHT. These themes facilitate a deeper understanding of different aspects to consider during the piloting, planning and training stages. They also provide general guidance on communication/engagement approaches, infrastructural requirements, necessary support for staff and strategies to overcome resistance. These insights aim to share learning to facilitate the successful implementation of ePMA at other trusts. Select below to find out more about each of the themes. Those who were most committed to the transition to ePMA were perceived as the ideal candidates to lead the pilots. ICHT chose to undertake two pilots. The reason for this was that having two separate pilots would expose the Project Leads to different patient cohorts, processes and clinician behaviours. At ICHT, the Consultant Lead for the pilots was very ‘hands on’ in the preparation stage prior to implementation. This individual would be present at the piloting wards, supporting junior doctors in the transcription of the paper charts from the admissions wards. Pilots at ICHT were conducted for approximately six months and had clearly defined exit criteria. The pilots at ICHT actively identified as many problems and issues as possible. This allowed for the development of preparation packs for the subsequent roll-out, where lessons from the pilots were used to reduce the risk of reoccurrence. For example, in terms of infrastructure, the pilots enable ICHT to better understand the number of drug rounds and the number of locums that would be needed and this information was used to plan for more time for areas with more complex needs. Introducing the Clinical Documentation software a week before ePMA was found to be an effective approach to avoid overwhelming people and ensuring they became familiar with the system ‘as a whole’. At ICHT, a clear structure of the pilots was not provided. Those involved in the pilots would have preferred to have been better informed about how their feedback was incorporated and how they could have better supported the pilots. Initial testing of a new technology shows whether a certain innovation ‘fits’ into the organisational structure of the recipient institution, but it also facilitates optimisation based on observations made ‘on the ground’. In addition, it helps identify the those who would be most capable of leading teams during the deployment phase and help build commitment to the innovation by achieving ‘early wins’. What is more, given that prescription errors might be more frequent while clinical staff adapts to the new system (McLeod, 2017) it is important to ensure that any potential risks are addressed before the deployment phase. Regardless of whether it results in an early success or the realisation that major reframing is required, piloting allows for learning to inform the deployment phase. INNOVATION ‘FIT’ – Initial testing of a new technology/system to be implemented shows whether a certain innovation ‘fits’ into the organisational structure of the recipient institution. OPTIMISATION – Piloting enables optimisation based on observations made ‘on the ground. IDENTIFYING LEADERS – Pilots can help Identify those who would be most capable to act as leaders during the deployment phase. IDENTIFYING RISKS – Potential risks to patient safety and hazards can be identified and addressed before the deployment phase. This sections outlines the key learning from the planning phase of Imperial’s ePMA implementation. As the case for any other transformation project, careful planning is essential to ensure the successful implementation of an ePMA system. Although the list of aspects to consider could potentially be endless, some of them merit particular attention. For example, the amount of time required for paper-to-digital transcription and formulary building should not be underestimated, as failure to do so could create “pinch points”. Related to this, strategies should be put in place to avoid the development of staff resistance because of ePMA-related additional work. In addition Clinical areas in which ePMA might be more complex (e.g. Haematology) should be identified early so that special measures can be taken to ensure patient safety is facilitate adoption within that clinical area. Another important issue to consider is that related to temporary staff and how they will have access to the ePMA system. The ePMA system contains patient-identifiable data and therefore carries information governance related risks. These and other important aspects to consider can be identified during piloting and included in “preparation packs” for those wards about to “go live” to utilise this learning, so they are best informed with their planning and strategy. Finally, in terms of the specific implementation strategy, there seems to be consensus that a sequential roll out rather than a “big-bang” approach minimises risks and facilitates progressive learning. However, the specific approaches taken by different trusts can differ (e.g. in-patient services first vs. outpatient first), possibly reflective of organisation-specific characteristics and constraints. Prior to beginning the ePMA journey, the Trust fully committed to it. They put a pause on any other change projects that would potentially impact upon the successful rollout and adoption of ePMA and Clinical Documentation solutions. At ICHT, Project Managers engaged with key individuals to obtain the names of all the relevant stakeholders before the Change Team met with them. Project Managers should contribute to the elaboration of the preparation packs, drawing quick conclusions of current processes and reporting back on necessary requirements. The Change Team should meet with all relevant stakeholders to fully understand their concerns and provide reassurance. They (along with the Project Lead) should also go through the ‘preparation packs’ with the different stakeholders to understand their workflows and identify potential problems that may arise. The pharmacy team at ICHT had 6 members. Although implementation of the ePMA system was successful, ICHT perceived that the addition of 2 extra members to this team would have eased pressured from the planning to the deployment phases. It can be extremely helpful to have individuals who are skilled in use of ePMA as part of the Pharmacy Team. The ePMA system roll-out design created several pinch points when support for a tranche and preparation for the next one overlapped. Additional time between each tranche or extra change support staff would have reduced pressure at these points. The floorwalking model proved to be very cost-effective, remaining under the predicted budget and providing services and support beyond what was expected. However, it is important to highlight that although cost-effective, the floorwalking team requires a dedicated manager and some administration, which need to be taking into account for planning/budgeting. Problems with workflows that run across several ePMA applications posed a considerable risk to isolated ‘go lives’ in several locations. It is therefore advisable to create testing scripts that run across applications so that general processes can be tested in all applicable modules. DEMOs and ‘test’ patients can be very beneficial, as they allow ward teams to practice. It was important to ensure that the ePMA Project Team has sufficient time for preparation. The ICHT Project Team were given an 8-week preparation phase followed by a 4-week on-site phase. It is important to consider that initial transcribing efforts might be lengthier than expected as a high degree of concentration is required to ensure accuracy. ICHT also stresses the importance of developing a clear protocol for transcription efforts after a downtime, since this allows a more efficient use of resources. ePMA creates some additional work in comparison to a paper-based prescription system. For example, automated reports are generated to provide accurate data highlighting issues regarding the management of medicines (e.g. non-formulary prescribing, missed doses, duplicate ordering). At ICHT, this additional work resulted in 30 extra minutes/ward/ day of manpower by the Pharmacy Team – with 90 wards that amounted to 45 hours of extra manpower a day. This extra amount of manpower needs to be accounted for during the planning stage. The most difficult area for ePMA planning, due to the significant risk of infection, is Haematology. For ICHT, the best solution prior to implementation was to have computer stations outside of the rooms. An important element in the planning stage was building the formulary with all the correct options: ICHT spent a significant amount of time checking and counter checking that a prescription electronically written was done in the right way. To increase user-friendliness, medications were coded by their branded name (not by their pharmacological name). This prevented frustration amongst the clinicians when searching for medicines on the system. The creation of controlled shared ePMA system accounts made it possible for departments/services with high levels of temporary staff to ‘go live’. Implementation of ePMA in these services would otherwise be impossible: unregulated shared accounts would pose ‘information governance’ risks and denying access to temporary staff would slow down the entire service. ICHT recommends avoiding specialised documentation and build work when possible, as this slows down adoption, risks improper recording of information and misses an opportunity to optimise documentation. Forms and build work containing only essential requirements and standardisation of documentation and ePMA workflows (when possible) constitute the optimal approach. ICHT produced a 40-page manual for pharmacy staff explaining the most efficient and correct use the ePMA system. This supplemented training and helped to standardise practice. The main learnings that emerged from the interviews with staff members at ICHT are in accordance with evidence that has been gathered from other ePMA initiatives within the NHS. Extracting key lessons from recent technology adoption efforts within the NHS, the King’s Fund stresses the importance of exhaustive planning, particularly in projects which, like ePMA, require a change in working practices and potentially extra amounts of manpower time. Regardless of whether the innovation effort requires existing staff members to take on additional tasks or whether the organisational change is so great that the team needs to be expanded, early planning is essential. It can help ensure that the adequate number of resources are allocated to the project and that effective communication strategies are put in place to avoid resistance among current staff members that might fear the ePMA system will result in large amounts of extra work. The Health Foundation provides simple yet comprehensive guidance on how to plan this communication strategy (helping identify relevant stakeholders, suggesting ways to tailor messages to different groups to encourage ‘buy in’ and aiding in the design of clear vision for the project). The development of a clear vision of change and engagement with the relevant stakeholders can in turn help understand the specific training needs of each clinical team and plan strategies to address them. 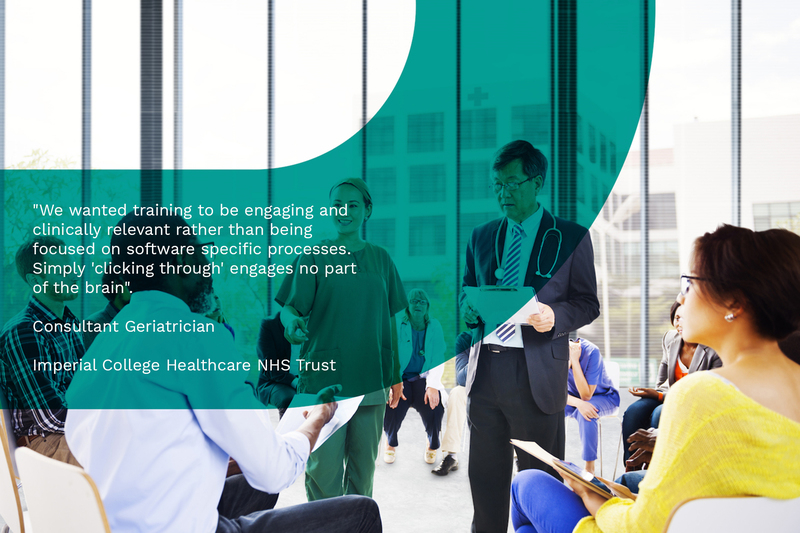 This approach was taken by St George’s Healthcare NHS Trust London during the implementation of their e-prescribing initiative. Tailored implementation packs to all the different clinical teams involved in medicines prescription and administration (pharmacists, nurses, doctors…) were distributed and a checklist of all the competencies that staff needed to acquire before ‘going live’ was used to assess readiness two weeks prior to deployment (similar resources can be found here). Engagement with the relevant stakeholders helps identify not only training requirements and needs for additional staff, but also areas that merit particular attention. ICHT found that having people with a good understanding of ePMA on the Pharmacy Team can facilitate implementation of the system. They also found that given the high risk of infection in the Haematology department, a special adaptation for this ward was necessary. Although these lessons might be specific to some trusts, planning is key to the adaptation of innovations to the particular needs of the adopting organisation. UNDERSTANDING REQUIREMENTS – Planning provides an understanding of the additional tasks that will need to be undertaken after the implementation of the new system. ORGANISATIONAL CHANGE – Awareness of organisational change provides insights that can be communicated to the current team and facilitates an assessment of whether the current team must be expanded. COMMUNICATION – Planning supports the creation of communication strategies that can help avoid resistance among current staff members that might fear new system implementation will result in extra work. 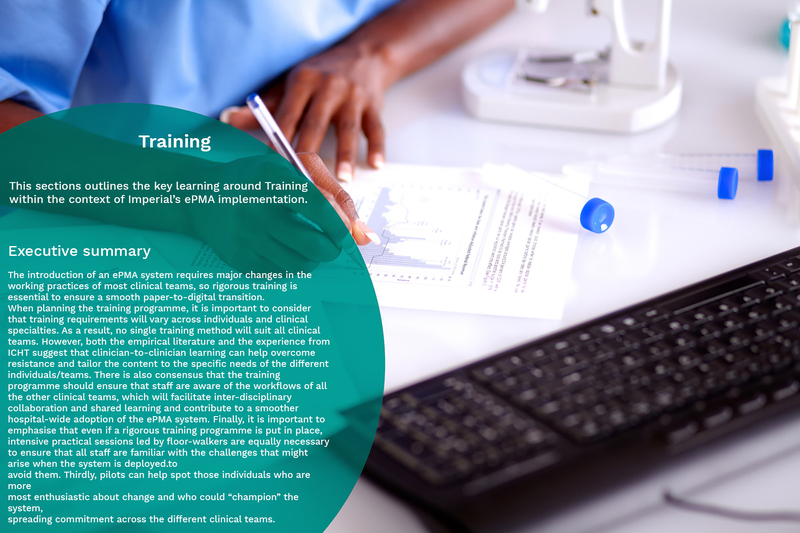 TRAINING NEEDS – This stage of the project can help understand the specific training needs of each clinical team and plan strategies to address them. ICHT undertook and recommend a Tranches Approach to implementation. The first phase of their project involved departments being categorised into medical and surgical, broken down into the tranches. ePMA was rolled out to wards in six tranches with around 12-14 wards per tranche. At tranche sites, the Clinical Documentation software was planned to be rolled out one to two weeks before ePMA system to avoid overwhelming users. ICHT recommend starting implementation in downstream wards and then progressively moving upstream to the Emergency Department (ED). This minimises risks because it follows the patient flow: patient safety is maintained since downstream wards have fewer patients entering and therefore need minimal paper to digital transcription. If patients are put on electronic prescribing at the front end (with the back end not yet live), at some point all the drugs that are on the system will have to be transcribed onto a paper chart for the end ward. It is therefore advisable to undertake implementation consequently from downstream wards working up to ED. ICHT suggests that an extra week of support might be needed for successful implementation and adoption in OP departments. Similar e-prescription initiatives in other parts in the UK have also taken a ‘divide and conquer’ approach to the deployment phase, rolling the system out in some wards before expanding across the whole organisation. However, the strategies the specific approach taken by different NHS trusts differs. While ICHT found it useful to implement the system in the downstream wards first, NHS Forth Valley in Scotland recommends starting the roll-out in admissions, as this allows the majority of prescribing staff to be reached more rapidly by following the patient from admission to discharge (see link below). Nonetheless, this approach requires extensive training of staff working in downstream services to ensure that they are not overburdened when the ePMA system is deployed. These opposite approaches illustrate the need to ‘adapt’ not only innovations but also implementation strategies to the specific needs of the recipient organisation (see King’s Fund 2018 report for other case studies of incremental adaptation). 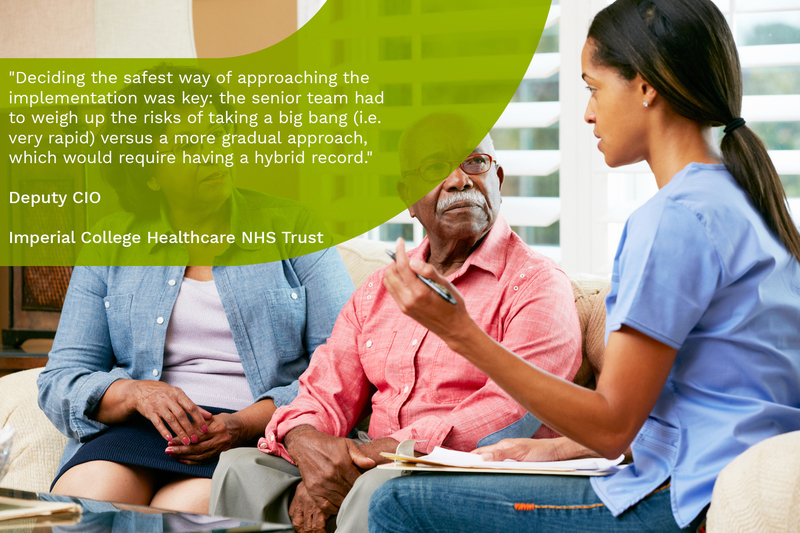 TRUST SPECIFICITY – In terms of strategy, the specific approach taken by different NHS trusts can differ. ADAPTATION TO THE NEEDS OF THE RECIPIENT ORGANISATION -Implementation strategies must be adapted to the specific needs of the recipient organisation. CROSS-TEAM COLLABORATION -Regardless of the preferred initial deployment strategy, a well-resourced ICT team that provides ongoing support throughout implementation and beyond and builds a strong relationship with clinical staff is needed to ensure change is achieved and sustained. This sections outlines the key learning around Training within the context of Imperial’s ePMA implementation. The introduction of an ePMA system requires major changes in the working practices of most clinical teams, so rigorous training is essential to ensure a smooth paper-to-digital transition. When planning the training programme, it is important to consider that training requirements will vary across individuals and clinical specialties. As a result, no single training method will suit all clinical teams. However, both the empirical literature and the experience from ICHT suggest that clinician-to-clinician learning can help overcome resistance and tailor the content to the specific needs of the different individuals/teams. There is also consensus that the training programme should ensure that staff are aware of the workflows of all the other clinical teams, which will facilitate inter-disciplinary collaboration and shared learning and contribute to a smoother hospital-wide adoption of the ePMA system. Finally, it is important to emphasise that even if a rigorous training programme is put in place, intensive practical sessions led by floor-walkers are equally necessary to ensure that all staff are familiar with the challenges that might arise when the system is deployed. There was not a single training method that suited all clinical teams. For example, although online tools allowed access to learning out-of-hours, they were not popular among staff. In the case of classroom classes, attendance was high for nurses but low among doctors, possibly because they could not be released for these sessions. Quick Review Guides (QRGs) were considered very useful by staff but not all members of the clinical teams read them. In light of this, ICHT recommends (when enough resources are available) implementing a multi-faceted training approach to facilitate maximum reach. Furthermore, they stress the importance of floorwalker familiarisation sessions in the weeks prior to the ‘go live’. This is because they ensure that hard-to-reach staff are trained and complement the prior multi-faceted training programme, providing a practical understanding of the challenges that might arise when the ePMA system is introduced into the clinical workflow. Sufficient training for pharmacy, nursing and medical staff members is paramount because the ePMA system can be complicated at first. If enough resources are at hand, equal amounts of time and resources should be allocated to the training of pharmacy, nursing and medical staff members. If resources are limited, it is important to prioritise training effectively and understand that some tradeoffs might be necessary (e.g. emphasis upon training the doctors may come at a detriment to sufficient training for the nursing staff). Extensive training for the Pharmacy Team. The Pharmacy Team at ICHT received extensive training by the Core Team. Without this level of training in the pre-implementation phase, it is unlikely ePMA implementation would have been as successful as it was. Providing the Pharmacy Team with information of ALL workflows. For smooth implementation, the Pharmacy Team needed to be aware of and trained in all three workflows: their own, the nurse’s and the doctor’s. Training for the clinicians can be provided one week prior to ‘go-live’. The rationale is that training will be ‘fresh’ in the minds of clinicians and minimal support post ‘go-live’ will be required. Care sets were built and used to explain the functionalities, uses and benefits of the ePMA system. If possible, training sessions for clinicians should be led by fellow clinicians with the presence of an ICT trainer. At ICHT, training provided by only the ICT trainer resulted in significantly more errors by the medical staff. Post-implementation, new doctors arriving at ICHT (junior doctors especially) receive a 3-day package of training with a large focus on clinical engagement. Training needs to be delivered in an engaging way in order for it to be effective. Training sessions should not be simply a ‘box to tick’ during the pre-implementation phase. Training and guidance for floor-walkers. Floorwalkers would benefit greatly from Trust-specific training materials that help them understand the vision of the Trust. They also need to be given extensive training in the use of the ePMA system and time to become familiar with it. In addition, it is important to understand that wards can be a daunting environment for the floorwalkers. Therefore, giving them clear instructions on how to best to approach consultants can help them made more at ease. ICHT produced a 40-page manual for pharmacy staff, explaining the most efficient and correct use of the ePMA system. It supplemented training and helped to standardise practice. A systematic review of the literature on NHS innovation efforts by the King’s Fund (2018) identifies lack of staff skills and training as one of the main barriers to the successful implementation of new technologies. More specifically, this review explains that lack of awareness of the workflows of other clinician groups and siloed approaches to working, learning and change greatly hinder the adoption of innovations. This shows that some of the themes that emerged during the interviews (like the necessity of providing the pharmacy team with information on all workflows, allocating equal resources to training pharmacists, doctors and nurses when possible and incorporating floorwalkers into the training plan) might be applicable not only to ICHT but also to other organisations attempting to adopt an ePMA system. Evidence stemming from previous NHS innovation efforts also suggests that clinician-to-clinician learning can help overcome resistance to change and facilitate a training approach tailored to the needs of the end-users. In their 2015 communications report, The Health Foundation argues that this is because clinician-to-clinician learning benefits from the use of existing networks between the clinical staff, overcoming communication barriers and favouring shared learning across different clinical teams. Additionally, this shared learning experience can facilitate spontaneous and opportunistic learning that complements formal training. All the empirical evidence outlined above, along with the themes that emerged during the interviews, suggest that the provision of clinician-led training to pharmacists, doctors, nurses and floor walkers as well as increased understandings of other clinical teams’ workflows are key to the successful implementation of an ePMA system. But this is not enough… it is essential to know how to plan the training programme, what to include in it and when to deliver it. Usefulness of assessing baseline levels of digital kills among staff so that the training programme can be tailored accordingly. Some Trusts also find it helpful to hire an Education Lead Nurse for e-prescribing (if resources are available). Finally, in cases in which the training is not digitised (maybe because a more direct clinical-led approach is taken), it might be useful to create a checklist to ensure staff are comfortable with the ePMA system before the roll out. AWARENESS OF OTHER GROUPS WORKFLOWS – A lack of awareness of the workflows of other clinician groups and siloed approaches to working can greatly hinder the adoption of new systems. PEER TO PEER – Clinician-to-clinician learning can help overcome resistance to change and facilitate a training approach tailored to the needs of the clinical team. SHARED LEARNING – Sharing learning experience can facilitate spontaneous and opportunistic learning that compliments formal training. Such clinician-led training to pharmacists, doctors, nurses and floor walkers as well as increased understandings of other clinical teams’ workflows can be key to the successful implementation of an ePMA system. 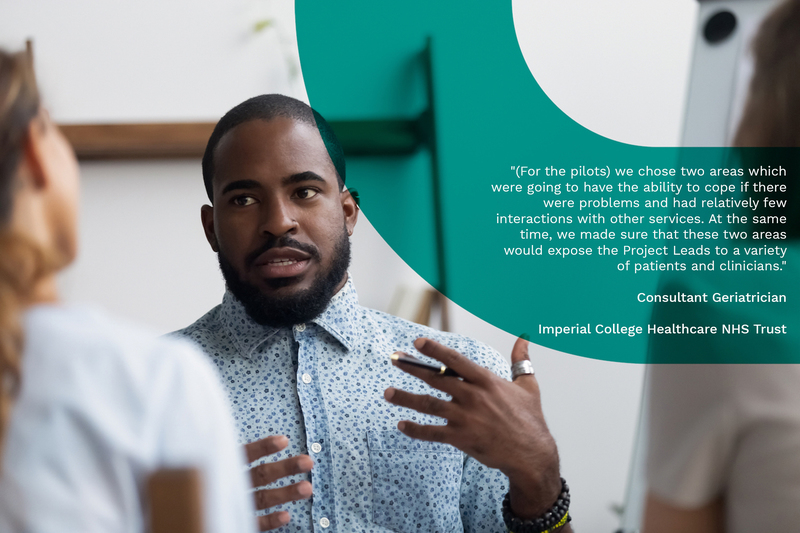 This sections outlines the key insights around Engagement, Communications and Leadership within the context of Imperial’s ePMA implementation. The importance of effective communication strategies in the successful implementation of an ePMA system is two-fold. Firstly, it facilitates project management by enabling progress monitoring and responsiveness to feedback. Although organisation-specific characteristics will determine the most appropriate strategy, ICHT found that having a single point of contact within the ICT team for each service made it much more manageable to for the project management team to track progress across services. Secondly, clear communication of benefits and early wins can help build commitment to change among staff. This engagement can be further encouraged by the identification of ePMA “champions” (e-prescribing enthusiasts that spread their excitement across clinical teams), the promotion of healthy competition among wards and the establishment of collaborations across technical and clinical teams. These engagement and communication tools are unlikely to result in a major cultural change within the context of an ePMA implementation project. However, consultative leadership, facilitation of 2-way communication, encouragement of healthy competition and enthusiasm about innovations can lay the foundation for the development of a change-friendly culture that actively seeks innovations and that readily accepts change beyond ePMA. Hospitals undertaking an e-Prescribing implementation project should have an ‘adaptive’ culture. Workflow changes are necessary for the project to be successful, so staff must be open to engaging in new ways of working. Momentum for adoption of the new system can be built by identifying individuals who are enthusiastic about the ePMA system. They can ‘champion’ the system and encourage less motivated staff members to embrace change. Healthy competition between wards proved to be an effective way to promote the desired behavioural change and drive improvement. Having good team dynamics is crucial. This can be greatly facilitated by providing the entire Project Team with a clear vision and end-goal at the start of the project. In addition, it is important that the Project Team is consistent (i.e. low turnover) from the very start, as this will help ensure a smooth transition from planning to implementation of ePMA. Appointing a single point of contact within the Information and Communication Technology (ICT) team for each service enabled the Project Management and Change Teams to track and manage direction within each service. Without this approach, it would have been unmanageable for the ICT Team to work with every workstream and frustrating for the Project Management and Change Teams to contact multiple ICT staff to track progress on a particular service. Having a single point of contact from the ICT Team can facilitate monitoring, project management and a more focused support to within-service implementation. However, it is also important to have cross-departmental meetings, as they can promote information sharing, transversal learning and inter-departmental collaboration by helping to overcome siloed mentalities. In general, the Senior Nursing Team was perceived to be much more enthusiastic about the implementation of the ePMA system that Senior Doctors. It was therefore easier to find a ‘champion’ within the Nursing Team. Additionally, Junior Doctors were found to be less engaged than anticipated, which highlights the need to avoid taking support from certain groups from granted. At ICHT, the Service (Clinical) Lead and their team engaged with ALL staff to build support for the adoption of the ePMA system across all teams. Their engagement efforts continued until the scales tipped in favour and ‘buy-in’ was attained. The Chief Pharmacist at ICHT was aware that the success of the project depended on the Pharmacy Team being committed to the adoption of the ePMA system. The Chief Pharmacist therefore made an extensive engagement effort to build enthusiasm about the project among the rest of the team. At all 3 ICHT sites, nurses and doctors from each ward attended presentations that included information about the system, its benefits and the changes to workflow needed to support its implementation. Strong relationships between the ICT and Pharmacy Teams. A strong relationship was forged between the Core Team and the ICT Department. This made it easier for the ICT Team to provide technical assistance to the Pharmacy Team whenever needed during the implementation process. ICHT took a collaborative approach to the creation of the care sets, involving Clinical Leads and Pharmacists in it. Although this collaboration was quite time-consuming, it was not as lengthy as it would have been without the support from the ICT team. ADAPTIVE CULTURES -Adaptive cultures empower clinical and managerial staff to actively accept new innovations/systems that can improve organisational performance. General tools to achieve this include clear acknowledgement of the risks involved, carefully planned communication strategies and the provision of ongoing support and consultative leadership styles in which staff feel supported. CHANGE CHAMPIONS -Involving local change ‘champions’ can help spread the adoption of new systems, particularly when new systems involve a significant change in working practices. HEALTHY COMPETITION -Healthy competition can encourage positive behavioural change and promote sharing of new learnings. INCLUSIVE ENGAGEMENT – Engaging will all staff members and developing a clear communication strategy are key. The vision for the project must be shared with everyone and opportunities for 2-way communication/feedback must be provided in order to build commitment across teams. In addition, information should be tailored to the specific needs of each team. However, it is also important to establish channels that enable information prioritisation and avoid overload: at ICHT, having a single point of contact within wards was an effective strategy to achieve this. COLLABORATION – Inter-team collaboration is essential for sustainable change. Clear acknowledgement of the risks involved in the paper-to-digital transition and detailed articulation of risk-management strategies can help overcome fears about patient safety and blame games. Carefully planned communication strategies that tailor their messages to different clinical groups (e.g how this will make their work easier) along with bespoke training can encourage staff members to ‘own’ the ePMA system. Ongoing support from the technical to the clinical team, clear communication of the potentially synergistic nature of this collaboration and celebration of small wins can help change ‘not part of my job’ attitudes. Consultative leadership styles in which staff feel supported to provide feedback and observe that their input is taken into account can encourage staff to be more proactive in their approach to ePMA. It is not surprising that local ‘champions’ and healthy competition also emerged as key facilitators in the adoption of electronic prescribing at ICHT. Reviews of empirical evidence by The Health Foundation (2015) and the King’s Fund (2018) stress the importance of involving local change ‘champions’ to help spread innovations across the NHS, particularly when innovations involve a significant change in working practices. Additionally, in their 2010 ‘Culture for Innovation’ report, NHS Improvement explain how friendly competition can provide an incentive for change in organisations that are normally resistant to it. However, they also stress the importance of avoiding grand prizes and explicit competitions with only a few winners but many losers, as these schemes can demotivate those who do not come out on top. The key to success lies in finding the right degree of competition, which encourages behavioural change and promotes sharing of new learning without demoralising those who initially struggle to adopt the innovation. Celebrating and sharing achievements and providing opportunities for 2-way communication (top-down and bottom-up). In summary, building team engagement, developing a consultative leadership style and having an effective communications strategy are key to achieving sustainable change. Only committed staff who have a clear vision of the end goal, understand the importance of collaboration and are willing to adapt their working practices are able to deliver sustainable change. This sections outlines the key insights around Resistance within the context of Imperial’s ePMA implementation. Electronic prescribing requires a major transformation in the workflows of most clinical teams, so resistance to change in working practices can be a major barrier to the successful implementation of an ePMA system. Although it is unlikely that the cultural constraints to the adoption of innovation can be addressed in a single project, simple but effective measures can help minimise resistance. For example, building strong relationships between the digital and the clinical teams early, listening to staff concerns and clearly communicating the benefits of the ePMA system can help spread commitment to the new system. In addition, close relationships between the clinical and ICT teams can facilitate more tailored training and help avoid disengagement among less “tech-savvy” staff members. Similarly, early engagement with senior clinicians (who might have limited daily available time, be more “set in their ways” and less keen on digital technologies) can help get them “on board”, reducing the risk of resistance from this influential group. It can be difficult to get users to engage with a new system when they have other priorities. Finding time for training and familiarisation can be very difficult and resistance might progressively build up. Getting everyone on-board with the adoption of the ePMA system was a big challenge for ICHT. Timing is crucial when trying to combat resistance: attempting to convince a user when he/she is busy only causes annoyance and encourages the build-up of resistance. At ICHT, resistance from senior consultants was a particularly challenging issue. Resistance within this group was due to time constraints, conservative attitudes and lack of willingness to change working practices. Older generations of clinicians sometimes struggle to adapt to the new ePMA system. It is therefore important to invest sufficient resources in training this group and engaging with them to attain their ‘buy-in’. Failure to do this can not only make it difficult to standardise practice across the whole team, but also encourage the build-up of resistance within this group. The training team at ICHT could have saved much time by looking at processes and activities from an end-user perspective rather than from system viewpoint. Having an engaged Pharmacy Lead was key to limiting the amount of resistance among pharmacists, as he/she would act as bridge between the Project and Pharmacy Teams, making sure any concerns from the latter were listened to. STRONG RELATIONSHIPS – Building strong relationships between teams can lead to ‘community support’, minimise resistance and encourage collaboration for system adoption. LISTETING AND UNDERSTANDING – Listening to and understanding the perspectives of staff regarding the new system to be implemented can facilitate closer relationships between the wider team and the team leads. TAKING FEEDBACK INTO ACCOUNT – Taking on board the concerns of staff, for example in terms of availability, can lead to the production of a co-working and training schedule, which includes time for training, with supportive arrangements for training sessions. Resistance to change in working practices is a well-known barrier to the introduction of new technologies in the NHS. A detailed description of factors driving this resistance and ways to overcome this is beyond the scope of this toolkit (The Health Foundation 2015 ‘What’s getting in the way’ report provides an accessible, yet comprehensive account of this). However, it is worth highlighting that many of the sources of resistance that emerged during the interviews (lack of ‘digital competencies, conservative attitudes among senior staff members, ‘timing issues’ and failure to understand the needs of ‘end users’) can be addressed by building strong relationships between the clinical and the ICT teams. Close collaboration from the start of the project can not only help the ICT Team change conservative attitudes among more senior staff members, but also understand their perspective better to tailor the training they provide to this ‘older’ group. Additionally, this close cooperation can make it easier to arrange training sessions. Considering this, it is not surprising that the strong relationship that was established between teams both during piloting and implementation played a key role in the successful adoption of the ePMA system. Providing support beyond the initial training and piloting is key to enable sustainable change and maintaining commitment to the ePMA project. There are many ways of doing this, but active support from floor-walkers, the Project Managers and Service Leads (i.e. proactive engagement rather than reactive troubleshooting) during the initial weeks of implementation seems to be particularly effective in empowering clinicians to deal with future challenges. Cheaper tools like online user groups and posters tailored to the different clinical teams can also be useful, as they provide easy access to information when floor-walkers or Service Leads are not available. In addition, it is essential to establish feedback channels so that problems that arise after the “go live” can be addressed. This is particularly important for groups that might need extra support (e.g. Senior House Officers in charge of ward rounds or Senior Clinicians that could not be trained properly due to lack of availability), as mistakes made by these groups might have negative knock-on effects on all workflows. During implementation, continued guidance was provided for the Pharmacy Team. Significant additional work was required with the implementation of ePMA, so this guidance was instrumental in helping to standardise working practices and prevent errors and delays in medicine administration. Ongoing use of the system results in many user queries and the need for troubleshooting. The ePMA software supplier at ICHT has created an online platform that allows users to collaborate and share information. There are hundreds of thousands of posts with useful lessons from other users, so ICHT found joining this online group incredibly valuable. SHOs are the main medical group responsible for ward rounds, entering information and prescribing. Therefore, it is essential to support them well both during ePMA implementation and post-implementation. It is important to ensure that there is sufficient support for the Senior Medical Staff in the early stages of implementation. This group is not often available to be provided with enough training. As a result, they are sometimes not completely familiarised with the system during implementation and are likely to rely upon other staff members (e.g. the Pharmacy Team, the Nursing Staff or floorwalkers) for support. Out-of-hours technical support for hardware/software failure, downtime and critical systems was provided. In addition to this, the wider team provided support rectifying simple errors that were made in prescribing. It is important that floorwalkers are pro-active and engage with the ward teams. At ICHT, they were initially too reactive, waiting to be approached. However, their role proved to be much more useful when they actively engaged with the teams to tell them what they were doing well (or wrong) and suggest improvements. Floorwalkers can provide much needed support if they are present during all ward shifts. At ICHT, they were required to cover all the shifts (including the night shift): 9am-5pm, 3pm-8pm, 8pm-12am. Feedback and issue escalation mechanisms were adopted during implementation at ICHT. This enabled efficient communication and changes to be made quickly in response to queries from staff. IT floorwalkers, the Change Team and the IT Helpdesk were important for the correct functioning of these feedback channels, as information would usually be passed through them. Having the Project Manager at hand. It can be very helpful to have the Project Manager present to hand-hold through the process, particularly during implementation. At ICHT, the Change Team placed posters in the wards that were about to ‘go-live’. They acted to remind staff of the new processes and workflows. They were easy to read and outlined the starting points, stops and continuations so that prescribers could see exactly how they should be working on the ‘go-live’ day. At ICHT the posters and their guidance were based wholly on the mindset of the prescribers (the doctors and nurses) and their interactions with patients. CONTINUOUS, BOOTS ON THE GROUND SUPPORT – Only continuous, ‘boots on the ground’ support can ensure not only that a new system is adopted but also that it is ‘optimised’ to tailor the specific needs of the recipient organisation. MULTIFACETED APPROACH – There are advantages to a multifaceted approach to ongoing support. The Project Team and floorwalkers can help ward staff ‘on demand’, tailored visual aid can aids memorisation of workflows and online user groups can facilitate personalised troubleshooting. SOME GROUPS NEED EXTRA SUPPORT – Some groups (e.g. senior physicians) might need extra help. These groups must be identified and measures must be taken to ensure that they feel supported and become familiarised with the system. It is important to stress that for a clinical-digital partnership to bear fruit it must be well resourced. In this case, clinical teams received support from the Project Team, and the floorwalkers, with senior staff members and SHOs receiving extra attention and the online user group providing troubleshooting support for challenges that arise from continuous use. There is a growing consensus that the NHS spends too little money on the spread and adoption of innovation (less than 0.1 % of the total innovation budget, according to the King’s Fund 2018 report on Innovation Spread). This is in marked contrast with the private sector, where sometimes more resources are spent on scaling up successful projects than on development of innovations. In light of this, organisations like the Nuffield Trust (2017), The Health Foundation (2015) and the King’s Fund (2018) agree that it is necessary to support ‘adopters’ of innovation beyond the initial piloting of the new technology. Only continuous, ‘boots on the ground’ support can ensure not only that the innovation is adopted but also that it is ‘optimised’ to tailor the specific needs of the recipient organisation (e.g. varying levels of ‘digital literacy’ among clinical staff or specific characteristics other IT systems used in the Hospital/Trust). The successful adoption of an ePMA system requires not only the right digital set-up, but also an adequate physical infrastructure. Although sometimes not obvious, physical constraints such as lack of power sockets or limited room size it can be rather limiting. It is therefore important to examine infrastructural requirements (and upgrade as necessary) prior to deployment of an ePMA system. Similarly, it is essential to allow some flexibility in equipment budgeting and to establish a close relationship with the technology supplier early on. This can help meet unexpected demand and adapt the system to problems that could be encountered after the “go live”, contributing to a smoother paper-to-digital transition. However, this flexibility in budgeting and in software build must be accompanied by adequate staffing levels to avoid “pinch points”. The pilots revealed the importance of adapting the existing infrastructure to meet the requirements of the new workflows. For example, additional power outlets and network points as well as longer-lasting batteries might be needed. Furthermore, appropriate protocols to deal with structural constraints (e.g. drug carts being too big for preparation rooms, inadequate amount/location of printers) may be necessary to facilitate the seamless running of clinical services. In terms of equipment budgeting, the creation of a small ‘reserve’ fund was useful because it made it possible to meet higher-than-expected demand for expensive power carts, printers, scanners and desktops… In addition, monitoring and auditing of equipment use allowed for underutilised equipment to be reclaimed for later stages of the roll-out, helping reduce expenditure in equipment. Despite the advantages of this flexible approach, “last minute” purchasing of certain items meant that there was limited time to place orders, obtain the financial sign-off and test new equipment (particularly if orders were delayed). If some flexibility in equipment purchasing is allowed, technical staff might need to work extra hours/weekends to meet tight timelines. This requires additional financial expenditure, but also extra engagement with the technical teams to avoid the build-up of resistance. Moreover, clinical teams might need to be reassured that, despite limited equipment testing time, the wards is ready to ‘go live’. Therefore, when possible, orders for additional equipment should be agreed on during ePMA deployment in the previous tranche to avoid extra work and engagement efforts. Major build work within the ePMA system was beyond the scope of this implementation project, but some system adaptations were delayed because of poor engagement with the supplier. In light of this, ICHT recommends that a better management structure is put into place to deal with supplier-related issues, even if major build work is not planned. Adequate infrastructure is key to ensuring successful adoption of the ePMA system, so investing in upgrading infrastructural capacity might be necessary. Flexibility in equipment budgeting allows to cope with unexpected additional demand for equipment, but the additional technical work and subsequent tight deadlines must be accounted for. In addition, appropriate communication strategies must be put in place to ensure clinical staff feel reassured that the ward is ready for the “go-live”. Supplier engagement is key, as it can facilitate troubleshooting and system adaptations. 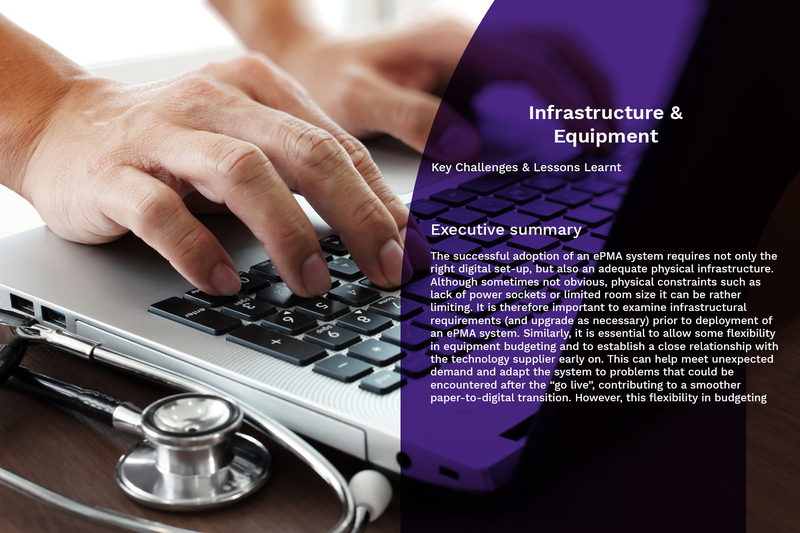 The lack of adequate physical and IT infrastructure has been cited as a major barrier to the adoption of innovations into the NHS in recent reports by the Health Foundation (2015) and the Nuffield Trust (2017). This might be explained by the fact that the NHS spends less than 0.1 % of its total innovation budget on adoption and spread (King’s Fund, 2018) and therefore might do little to address infrastructural constraints to innovation. In light of this, careful assessment on infrastructural capacity and planning of necessary changes and upgrades can be seen as key facilitators to innovation adoption. Although having adequate infrastructural capacity in place can make ePMA implementation easier, it is not enough to ensure that there is a fit between the recipient organisation and the new technology: the ePMA system needs to be tailored to the specific needs of the institutions (King’s Fund, 2018). Engagement with suppliers can greatly facilitate system adaptations, but it can also go beyond that. Organisations like the Nuffield Trust and the Health Foundation suggest that continuous engagement with suppliers could stimulate the co-design of new technologies between industry and NHS organisations, helping ensure that there is the best possible match between supply and demand. This goal might be too ambitions, but it illustrates increasing awareness of the importance of supplier engagement in facilitating implementation and delivering sustainable change.